When this you see, remember me! In the Colonial United States, samplers played their traditional role. 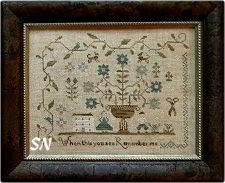 As in 16th and 17th England, Colonial samplers were typically produced by schoolgirls as a way learn needlework skills. Teachers favoured the band format for reasons of thrift, although by the 18th century, samplers began to get shorter and wider. Family records and genealogies were popular in New Hampshire, sometimes presented as straightforward lists, other times fashioned into landscapes or even trees hung with fruit bearing the names of various generations of offspring. The practice of teaching letters and preserving family histories via samplers continued through the 1800s, although its heyday had ended by the middle of the century which is a shame. These pieces of needle art have taught us so much about our history as have signature quilts. I find that looking at some of these antique samplers is an eye opener and they are truly amazing, the collection at the Victoria and Albert museum in London is outstanding. If they are are not on show you can organise a private viewing... go to their website and take a look, you can apply but do this in plenty of time for your visit. There is a phone number which can speed up the process. Your can order up several for closer inspection...... If you are reading this from abroad and are planning a visit to London and fancy doing this then don't delay it is a great few hours if you love stitchery and history. children too it would fill two walls!! ... yes they were very fruitful in that department. My Grandpa himself was one of 14 children so you see why it would not work, not sure they sell that size aida to be honest!! Loving all things vintage as I do, I could fill our home with so much but you do have to be a little careful other wise it can look like a junk shop!... With us thinking about moving and me have a large workshop when we do, I can go about decorating that with things that totally inspire me and that I love. I would like a work space but also for it to look cosy and inviting as well and may in time take some classes there..... So I am hoping to move within in a year. Well I am off to my stitching so take care and Happy Stitching yourselves!